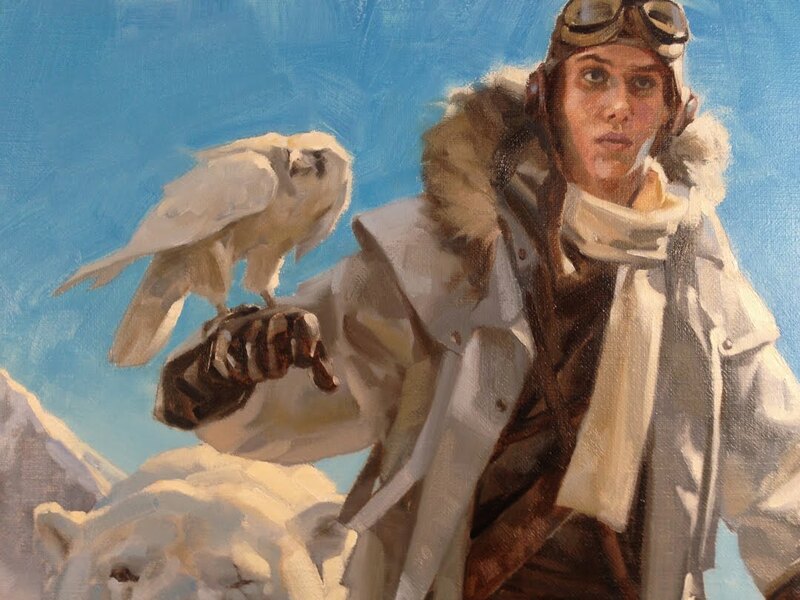 Above The Timberline by Gregory Manchess is a unique book, that isn’t quite a graphic novel, instead it is a highly illustrated book, a so-called “painted novel”. 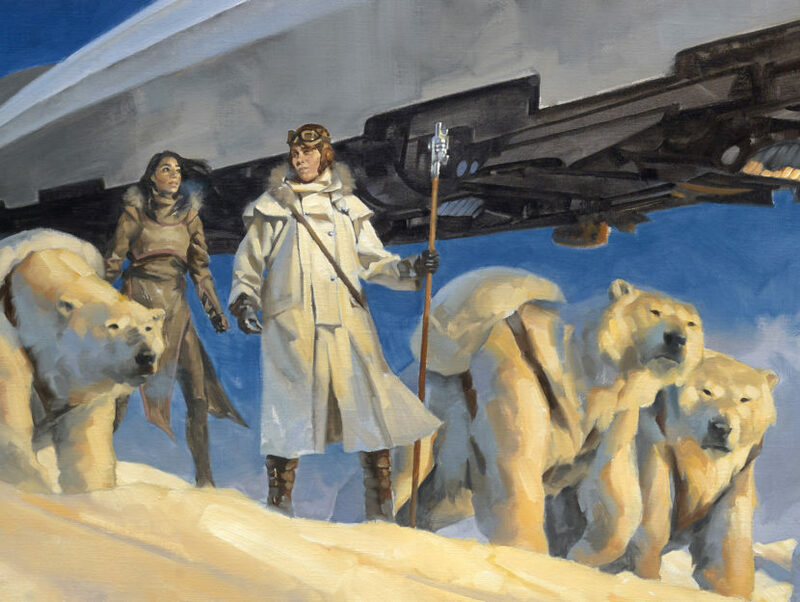 Very reminiscent of the Dinotopia book series (minus the dinosaurs but add polar bears) by James Gurney, this large sized book has 240 pages of lush paintings that transport you to another time and place. Set in the year 3518, a cataclysmic event approximately 1500 years ago (that just happens to match our current date!) caused the Earth’s mantle to spin faster than it’s crust, resulting in huge tectonic shifts. Continents broke away and collided with others destroying cities and plunging them underground, with the original equator thrown towards the poles, and the poles at the new equator. Society was disrupted and much technology was lost as a new extreme ice age descended upon everyone. Now the current population seems to be in the early 20th century with British overtones, but bits and pieces of past mechanization such as airships remain so the entire setting has a steam punk vibe. The premise of this alternate future has the son of a missing famed explorer searching for his father who had been seeking a lost city under the snow. We have past journal entries from the father, Galen, that provide clues for Wes to follow. Soon into his journey through the Phantom Waste he meets up with some nomads and it just so happens that a lovely young woman of the tribe, Linea, helps him escape. Her knowledge of the terrain is invaluable as they work together to find Wes’s father, ahead of a former friend now turned villain who wants the glory for himself. Rhinos had to adapt and now have furry coats! The artwork is exquisite. Manchess is known for his art in Newsweek, Time, Atlantic Monthly, and National Geographic and the beauty of his work can not be understated. He vividly creates a believable tundra landscape, and paints his characters, animals and interior backgrounds with precision. Although Manchess has contributed art to other books, this is the first he has authored, and at times the characterizations were thin. However, the narrative is set up for more adventures so I’ll definitely check out what further exploits await Wes and Linea! Same here. I’ll be on the lookout for whatever else he publishes. Great review. I didn’t even realize the dates matches up to today. With the amount of work he pours into the paintings, I expect any sequel might take awhile.